Although Magic Chef's manufacturing history -- which spans more than 80 years -- includes numerous dishwashers, the company now known as MC Appliance has transitioned into smaller devices, such as microwave ovens, ice makers and wine coolers. Because Magic Chef produced a wide variety of dishwashers over the years, your appliance's user manual serves as the best source for troubleshooting tips. However, some basic troubleshooting methods recommended by the manufacturer apply across the spectrum of Magic Chef models. Image of a woman loading the dishwasher. Check your home's electrical service panel for a blown fuse or tripped breaker and replace the fuse or reset the breaker as needed. Power issues may prevent your Magic Chef dishwasher from starting at all. Ensure that the door of your dishwasher is securely latched -- a common feature across Magic Chef washers, the unit will not fill if the door is not securely latched. Turn the valve on the water supply line connected to the dishwasher to the open position if the washer does not fill with water. Address any kinks in the line to encourage water flow. Check your washer for an overfill protection float, typically located in the front corner of the interior compartment. Press the circular float down to release it if it has become stuck. This helps a non-filling dishwasher fill with water. 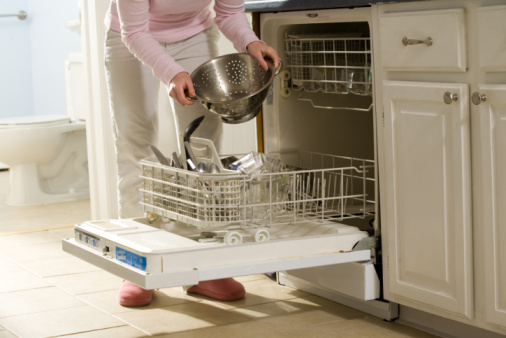 Clear the drain in the dishwasher's interior compartment of obstructions or food debris to fix a non-draining washer. Allow your sink's hot water to run for a few minutes before starting the dishwasher to clean soiled dishes more thoroughly. Scrape your dishes before loading them for best results. Readjust your load to cut down on noise during dishwasher operation. Magic Chef dishwashers typically rely on a moving wash arm, so arrange the dishes so that they do not interfere with the arm's movement. Place knives in the basket with handles up, and forks and spoons with handles down. Do not place glasses over the tines. Give the dishes enough space so that they do not bang against each other during washing. De-select your Magic Chef dishwasher's Hi Temp Wash cycle, AccuTemp setting, Temp Boost feature or equivalent feature if your washer takes too long to wash dishes. Settings such as these take extra time to heat water. Select these options, if available, to remedy cloudy or spotted glassware. Add a rinse aid to the detergent cup if your glasses tend to come out clouded. Fight odors by filling the appliance's wash detergent cup with baking soda and running a Light, Quick Wash, Rinse Only or equivalent cycle. Allow the water to circulate for about 10 minutes, then open the door to interrupt the cycle and let the washer air out overnight. In the morning, close the door and restart the dishwasher, allowing it to complete the cycle. Use vinegar rather than baking soda to reduce the "new appliance" smell.